Red Lobster made for one of their unlimited shrimp feasts, barbeque style shrimp. Barbeque style shrimp is a Cajun way of making shrimp, spicy and buttery this is an easy way to make shrimp in a unique style. Now when we say barbeque style shrimp, that doesn’t mean shrimp covered with barbeque sauce, rather, it is shrimp baked in the oven in a spicy sauce. Be sure to serve this with rice or plenty of bread so you can mop up the extra sauce. Make spicy Red Lobster Cajun Shrimp at home. Place the margarine in a 13 x 9 baking pan, and then place the pan in the oven. While the pan is in the oven wash and peel shrimp. Devein the shrimp. By the time you have finished prepping the shrimp, the margarine should be melted in the pan. In a small bowl mix together the spices and blend well. Place shrimp into the pan, and then sprinkle on the seasonings you have just blended together on the shrimp. 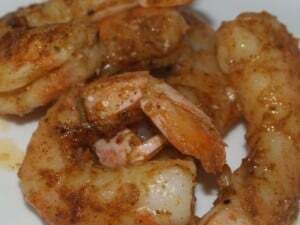 Mix the shrimp, margarine, and spices until the shrimp is coated well with margarine and shrimp. Bake for approximately 15 minutes, remove shrimp and check for doneness. The shrimp should be pink when done. So, our recipe uses margarine, as most restaurants use margarine because it is less expensive than butter. If you really want to try to ramp up this recipe use butter instead of margarine. Be sure to serve the shrimp with fresh lemon wedges. 16 Tablespoons to a Cup. I calculated 7 Tbsp. Yes I agree. I’m a fanatic when it comes to heat but this was way overboard in the burning that I had to take Zantac. I reduced the cayenne spice to 2 tsp., reduced the salt to 1 1/2 tsp., Raised the Paprika up to 1 1/2 Tbsp., dropped the mustard to 1 1/2 tsp. and added 1 1/2 Tbsp. of packed brown sugar. This made the perfect harmony to the spice blend. Sweet and Spicy. Was a great hit. This was a completely spicy dish when served at the Red Lobster. I typically try to duplicate recipes, not to re-work them. I will have to try your spiced shrimp. I love the combination of sweet and spice. Holy Blazes Batman! This was H*O*T !!! Wowza !!! YOW !!!! That said – I loved it! Thank goodness I had a salad to put out the heat between bites. I used all butter and added that 1/2 cup of white wine. Served over Giada De Laurentiis Organic Bucatini pasta (found at Target). My husband was literally sweating profusely. Wouldn’t serve it for company – LOL. Oh, and btw, just because you eat it cold the next day – it’s just as HOT! You know I thought this dish was very HOT when I tried it. In fact I was really surprised that they would serve something that was so spicy. I made this last night and ended up throwing it out. We thought it was TERRIBLE. I cut the cayenne to 1 tsp. instead of 4 and halved the other spices. It burned all the way down. (And we love New Orleans food). I agree with Jen. This was really good but WAY too much cayenne. I will make again but tweek the spices. For an extra special treat, you can add 1/2 cup white wine to the recipe when adding the seasonings. It cooks down and gives the shrimp a tasty sauce. Does anyone know how many servings this makes? OMG, it’s a trans fat feast! Do you think it would work with canola oil? Actually I think the butter would just make it a saturated fat feast. Canola oil would work, I think you would lose some of the flavor that butter gives.